Information is POWER! If you want to use this power, you must become a master of the boolean search. 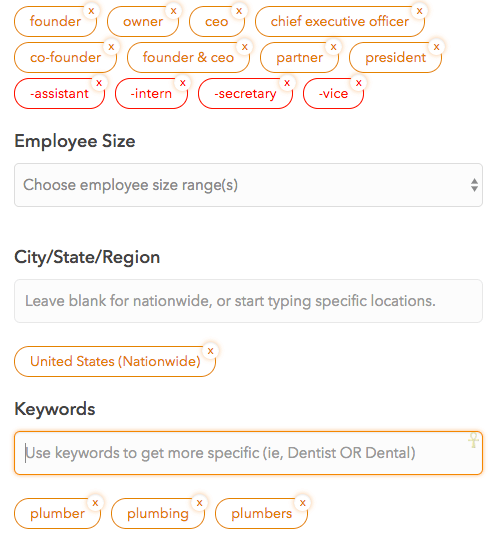 LeadFuze makes it possible to find just about everyone if you know how to use the granular boolean search option! Using a boolean search, you are able to search for a combination of keywords, titles, contact descriptions and more. This leads to more targeted results. The nice thing is that LeadFuze automatically does this for you across many different job functions (such as Owner, Marketing Manager, Sales Manager, etc). A few things are happening here. Basically, every title is an “OR” statement. So it’s looking for contacts in our database with the title Founder OR Owner OR CEO, etc. You may want to add additional titles like “Owner / CEO” or “Owner & CEO” or whatever other titles you think are relevant. The next thing that’s happening is it’s using “negative keywords”. This means anyone with a job title including “assistant” or “intern” or “secretary” won’t show up in the search results. Without the negative titles, you might see results for “Assistant to the CEO” or Vice Presidents for example. Using some real-life examples, we’ll show you how to get the most of out LeadFuze boolean search possibilities. So now this search is looking for all of those owner level job titles AND either plumber, plumbing, or plumbers in their description. This is searching what the end user might put as a company description, their bio on social media sites, etc. Each tag is basically automatically adding the OR statement. Even though two separate tags are an “OR” statement, there aren’t any quotes being used. So it is literally looking for “property” or “management” or “manager”. So be sure that when you have two or more words that go together, you put them in quotes! You want to be careful you don’t go TOO far into the weeds though. For example, if your results are in the hundreds then you’ve probably gone too far. This will limit how many people you can reach out to consistently. So you want to be able to get specific and dialed in, yet at the same time not limit yourself. For example, we see users all the time that limit their search criteria to say 11 to 50 employees. So if a company has 10 employees – you wouldn’t service them? If you would service them, then include 1 to 10, and 51 to 200 employees. Even if people respond with interest that you truly cannot help, it doesn’t mean you can’t help them with something or that you can’t help them completely later on. Using the previous example, if you’re going after plumbers and your sequence or service offered isn’t specific to “rooter services” then don’t worry about using that keyword! Similarly, if you are going after plumbers – what are some other similar industries you would probably be able to help? Construction companies? Landscaping? Painting? Contractors? 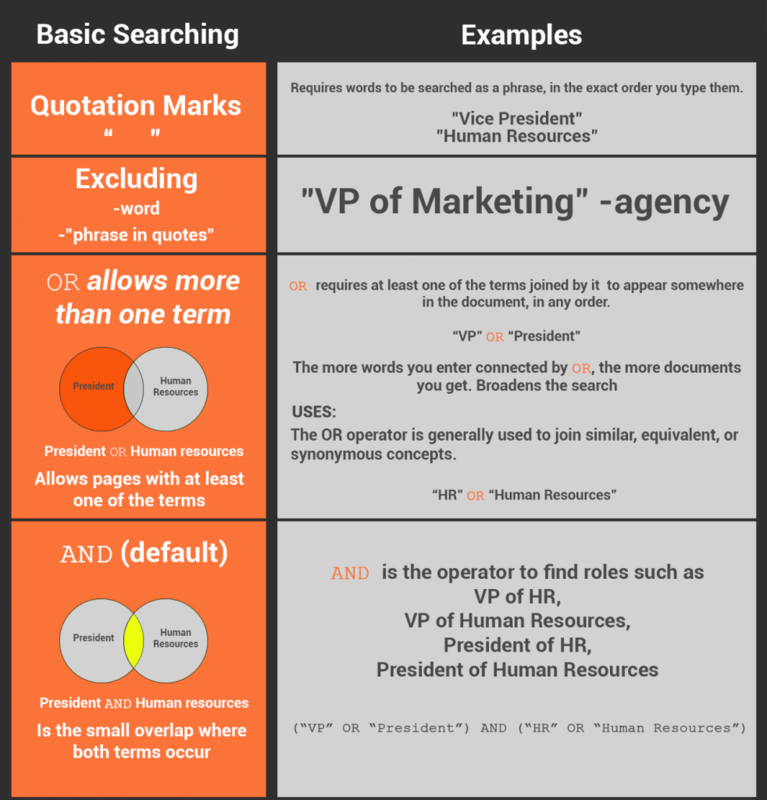 Here is a graphical breakdown of how boolean search works. Feel free to bookmark this image to maximize your searches. This actually applies outside of LeadFuze. You can use boolean search to dive deeper into other searches on Google as well. For continued reading, here are more advanced tips on boolean search. Send them a cold email!